1. Take Highway 169 North to Princeton. 2. Go west (turn left) on Highway 95 for 0.7 miles to County Road 102. 3. Go north (turn right) on County Road 102 for 1.7 miles to 40th Street. 4. Go west (turn left) on 40th Street for 0.6 miles. 5. Look for the farm on the right. 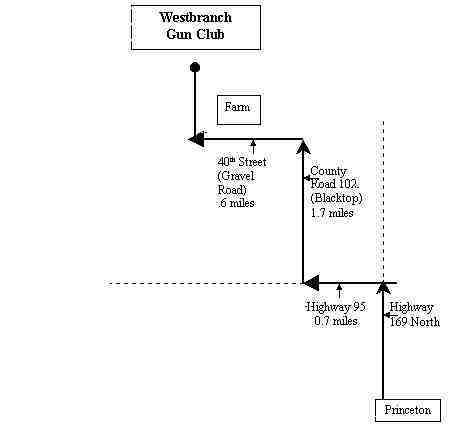 Just west of the farm is the entrance to the Westbranch Gun Club. 6. Go north (right) and go through the entrance gate. Follow the gravel drive back into the Gun Club. 7. Parking is south of the Club House on the west side.